The Supreme Court has ruled the Employee 3% Healthcare deductions withheld between July 1, 2010 through September 3, 2012 were illegal. 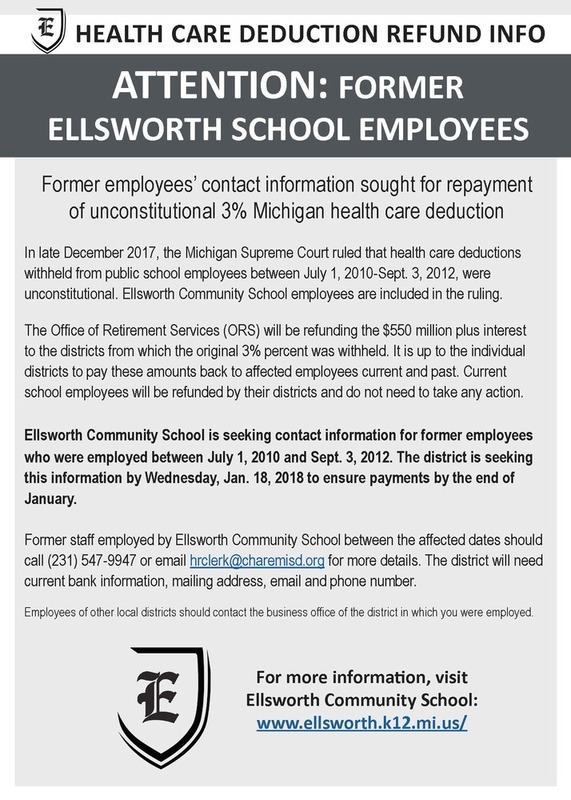 The Office of Retirement Services (ORS) will be refunding the deductions plus interest back to the districts in which the original Michigan Public School Employees Retirement System (MPSERS) 3% Healthcare was withheld. It is up to the districts to pay these amounts back to effected employees (current and past). FORMER EMPLOYEES ONLY: The Business Office will strive to verify current direct deposit, address, email and phone information for former employees to ensure payments are deposited into the correct bank account, and year-end W-2s can be sent to the correct address. Please contact the Business Services Department at 231-547-9947 or email hrclerk@charemisd.org to update your personal information. Business Services needs current bank information, mailing address, email and phone number. The information is requested no later than Wednesday January 18, 2018 to ensure you will receive payment scheduled to be released by the end of January. For our district specially, the original MPSERS 3% healthcare deduction was withheld from employees with the same guidance as all other ORS employee deductions. The deduction was taxed for Social Security and Medicare (FICA), but excluded from federal and state taxes. Consequently, as these amounts are refunded back to the employees, the amount will be taxable income in 2018 for federal and state purposes. The refunds will be paid through payroll to allow federal and state taxes to be calculated and withheld from the gross amount. These amounts will be included in your 2018 W-2 as taxable income. This will be a special payroll, separate from regular payroll. Office of Retirement Services is scheduled to send districts official refund information by January 22, 2018. The Business Services Team will work to process refunds before the end of January for current employee. Former employee who have contacted and verified their personal information will also be included in this special January payroll. January is a busy time for the business office and staff processes regular payroll, and issue 2017 W-2’s, as well as process the MPSERS 3% refunds. Our entire team appreciates your patience and understanding as we process official figures and information from ORS. Our hope is to get the refunds paid as soon as we can during this super busy time of year.